This beautiful Montauk condo is a perfect space to come enjoy everything that the area has to offer. This family-friendly community features an outdoor patio with a seating area for a meal or morning cup of coffee, a quick walk to Montauk's downtown area, the beautiful beach across the street and a pool to quickly cool off on hot summer days. 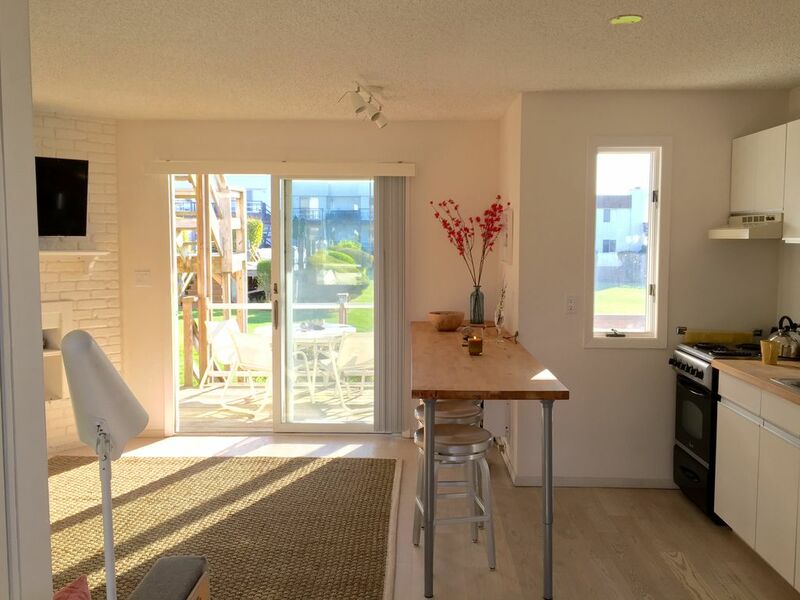 This 1 bedroom, 1 bathroom space has an open floor plan with everything you need for a beach trip! Hello! My husband and I are very excited to be new owners of a unit at the Atlantic Bluffs in Montauk! We recently purchased this property and we are so happy to be able to share this wonderful slice of Montauk heaven! This property has everything you need for a beach trip to Montauk. The beach is directly across the street and does not get too crowded! We are towards the end of Old Montauk Highway and there is a trail that you can take to walk or bike into town to run to the grocery store or grab dinner. The Atlantic Bluffs is a great location, has a pool for days that you want a break from the sand, great outdoor space and again, a perfect location!